If you are looking for a fun way to help animals and want to be a part of an exceptional non-profit organization, we're looking for you! Sign up with our web application and we will contact you with more information and to schedule you for a Volunteer Orientation. 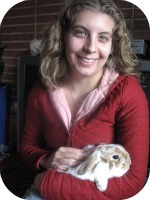 SaveABunny is a nonprofit group dedicated to rescuing domestic rabbits facing euthanasia at shelters and educating people about the joys of living with a house rabbit. We welcome compassionate and reliable volunteers to assist with a wide variety of needs. You'll have fun and make a difference right away in the life of a lonely animal! Volunteers of all ages are welcome, but youths under the age of 13 must be accompanied by an adult during their shifst. 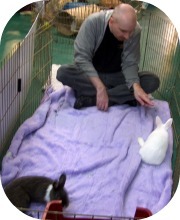 First of all, no-one leaves our Mill Valley location without the opportunity to cuddle one of our precious bunnies! Beyond the obvious enjoyment you get from spending time with these lovable creatures (humans included), you also gain satisfaction in realizing the direct impact you make on a rabbits life.